Persistent truncus arteriosus (or Truncus arteriosus), also known as Common arterial trunk, is a rare form of congenital heart disease that presents at birth. In this condition, the embryological structure known as the truncus arteriosus fails to properly divide into the pulmonary trunk and aorta. The "Type IV" proposed in 1949 is no longer considered a form of PTA by most modern sources. Another well-known classification was defined by Van Praaghs in 1965. Most of the time, this defect occurs spontaneously. Genetic disorders, and teratogens (viruses, metabolic imbalance, and industrial or pharmacological agents) have been associated as possible causes. Up to 50% (varies in studies) of cases are associated with chromosome 22q11 deletions (DiGeorge Syndrome). The neural crest, specifically a population known as the cardiac neural crest, directly contributes to the aorticopulmonary septum. Microablation of the cardiac neural crest in developing chick embryos and genetic anomalies affecting this population of cells in rodents results in persistent truncus arteriosus. Numerous perturbations affecting the cardiac neural crest have been associated with persistent truncus arteriosus, some of which include growth factors (fibroblast growth factor 8 and bone morphogenetic protein), transcription factors (T-box, Pax, Nkx2-5, GATA-6, and Forkhead), and gap junction proteins (Connexin). The cardiac neural crest also contributes the smooth muscle of the great arteries. Treatment is with neonatal surgical repair. 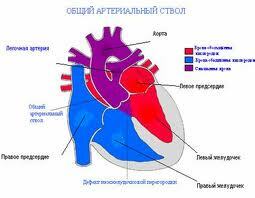 The ventricular septal defect is closed with a patch. The pulmonary arteries are then detached from the common artery (truncus arteriosus) and connected to the right ventricle using a tube (a conduit or tunnel). There have been cases where the condition has been diagnosed at birth and surgical intervention is an option. A number of these cases have survived well into adulthood.